employees: Gaston, Hallsy, Keener, Kenny, others. 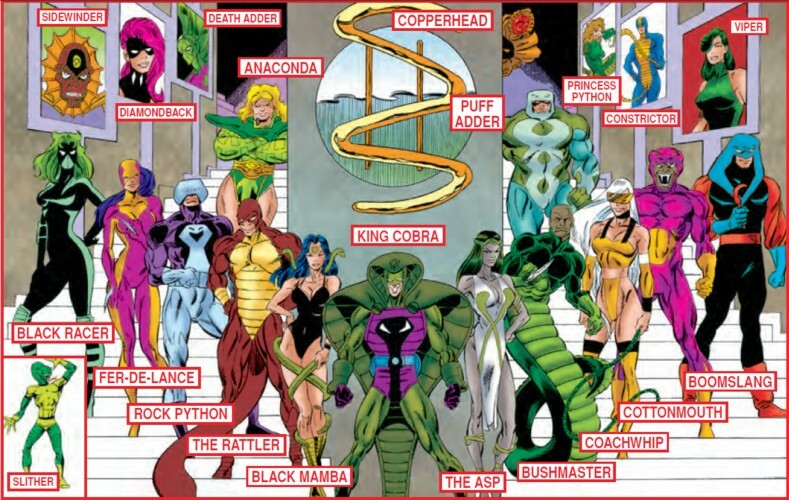 Purpose: The Serpent Society is a mercenary group, effectively a trade union of snake-themed villains, banded together for mutual security, benefits, profit, and protection. 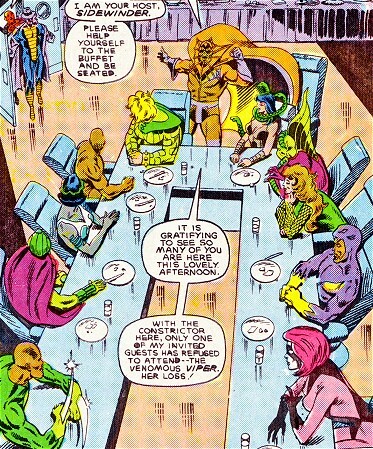 Affiliations: Created from Sidewinder's Serpent Squad; absorbed members from Viper's later unnamed "Serpent Squad"
(Captain America I#310) - At a posh midtown Manhattan hotel, Sidewinder (Voelker) had invited several serpent-themed mercenaries to attend the organizational meeting for the Serpent Society; only Viper (Madame Hydra) declined to attend. Those present were Sidewinder, Black Mamba, Death Adder, Princess Python, Cottonmouth, Diamondback, Constrictor, Bushmaster, Cobra (later King Cobra), Asp, Rattler, and Anaconda. Sidewinder's pitch was to mimic the heroes and to band together as a united group. He'd spent the previous nine months laying the groundwork for his new group, and promised a guaranteed pay scale, insurance, medical plans, pensions, greater access to tools and data, and, thanks to Sidewinder's teleportational abilities, no fear of long-term imprisonment. All but one agreed to join; Constrictor refused and left, even alerting the Avengers to their existence so as to eliminate possible rivals. (Captain America I#310) - To test their ability to be team players, Sidewinder split the group into three sections, and set each group out in a van to retrieve objects that he believed would be of use to the Society. Anaconda, Rattler, and Cobra went to the abandoned Brand Long Island complex (410 Gannon Avenue, Long Island City) where Brand's mutagenics department had created Sidewinder and his original Serpent Squad. Captain America (alerted by the Constrictor) interrupted and captured Anaconda, but Rattler and Cobra escaped with the equipment. Sidewinder quickly freed Anaconda from jail, and that evening she beat Constrictor into unconsciousness while Cobra watched. (Captain America I#311) - Following the successful completion of all three tasks, the group reconvened in their new headquarters, the Serpent Citadel. Seeking to advertise the group, Sidewinder broke them into teams of two and sent them to contact all the major criminal and subversive organizations in America. Among the contactees were the Maggia, Zodiac, Secret Empire, Kingpin, AIM, and Hydra. 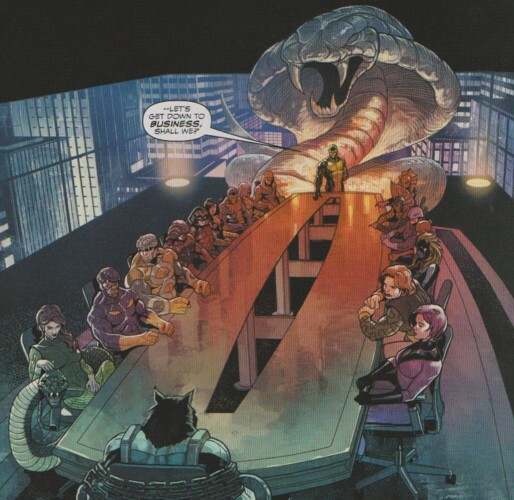 Asp and Cottonmouth made contact with the Kingpin in Manhattan, while Diamondback and Bushmaster made contact with AIM's inner council, who, after Bushmaster noted that satisfaction was guaranteed or the group would forfeit its fee, agreed to hire the group to hunt down and assassinate MODOK. (Captain America I#312) - Still teamed, Diamondback and Bushmaster investigated an abandoned AIM headquarters (it had been demolished during a MODOK/Hulk fight) on the Maine coast. Concluding that the base was truly abandoned, they set a time-bomb to destroy the whole mountain in case MODOK tried to return. (Captain America I#313) - Investigating a sunken AIM submarine on the Atlantic coast, Bushmaster and Diamondback found MODOK, who was trying to recuperate. MODOK escaped, slicing off both of Bushmaster's prosthetic arms in the process. Diamondback rescued Bushmaster, returned to their Serpent Saucer, and notified Sidewinder, who quickly summoned the rest of the Serpent Squad from the sites they'd been investigating. He ordered Diamondback to care for Bushmaster while Sidewinder arranged to have him transported to the infirmary, and the other serpents to hunt for MODOK. They found him in a local mall; Diamondback took charge of the Society members (to Anaconda's annoyance) and they headed in. Princess Python decided to flee rather than face MODOK, but was stopped by Captain America; she revealed to him the existence of the Serpent Society and the fact that they were pursuing MODOK; Captain America let her go. After a "gas leak" announcement (arranged by Captain America) emptied the mall, the team cornered MODOK but Captain America intervened; Cottonmouth ordered Asp, Diamondback, and Black Mamba to take out Cap while the rest attacked MODOK. Captain America quickly defeated the three women, but Death Adder and Cottonmouth delivered the killing blows to MODOK before Cap could stop them. (Captain America I#315 - BTS) - Sidewinder freed from jail those serpents that had been imprisoned, and had Princess Python captured and brought to the Citadel. (Captain America I#315) - Needing MODOK's corpse as proof of their success, Anaconda, Black Mamba, Asp, and Cobra stole the body from the Monmouth County morgue; no one was killed in the theft. The foursome delivered the body to AIM and received $100,000 in payment. Sidewinder was "making an example" of Princess Python (with an intent to ransom her to the Circus of Crime) when the team returned with the money which Sidewinder then distributed to the rest, with commendations and bonuses going to Death Adder and Cottonmouth for inflicting the killing blows; this was interrupted by a call from the Porcupine (hoping to sell his armor to the Society), but Sidewinder quickly hung up on him. Porcupine soon called again, claiming to have captured Captain America, and Sidewinder sent Death Adder, Rattler, Cottonmouth, and Diamondback to investigate. This proved to be a trap arranged by Captain America, who captured three of the four (Diamondback escaped). Sidewinder soon freed them all from jail, but Captain America learned how they were escaping. (Captain America I#380 - BTS (fb)) - Princess Python was mindwiped by the Society. (Captain America I#318) - Death Adder was assigned to transport Princess Python to the Peoria to ransom her to the Circus of Crime for $10,000. His Saucer was shot down over the South Bronx, and he was shot and killed there by a Scourge. (Captain America I#319) - Rattler and Cobra combed the wreckage of Death Adder's Serpent Saucer, but could find no clues to his disappearance. All the Serpents (except Diamondback, who was out on a solo mission) were looking for him, and were present when Sidewinder teleported in with Death Adder's body, having found it in the local morgue. Sidewinder ordered everyone to drop all missions and concentrate on finding the killer. Cobra and Bushmaster invaded some AIM loyalists, Asp and Anaconda went after the Circus of Crime, Black Mamba spoke to Death Adder's parents, Rattler and Cottonmouth sought information from some of the Kingpin's underlings, and Diamondback investigated the Foolkiller (Greg Salinger) in Indiana. (Captain America I#320) - When Diamondback failed to report in, Sidewinder sent Cobra after her. She was in a hospital outside Akron, Ohio, having been shot by a local farmer. Cobra returned Diamondback to the Citadel, though a Scourge shot at their Saucer as they left, missing the fuel tank by mere inches. (Uncanny X-Men Annual#13 - BTS (fb)) - At some point, Sidewinder secretly placed tiny tracking chips in the skulls of all the Society members, allowing him to track them and teleport to their locations. He later told Diamondback and the X-Men about these. (Captain America I#337) - In Las Vegas, four previously unknown snake-themed villains, Fer-de-Lance, Black Racer, Puff Adder, and Copperhead, committed what was at least the second in a string of casino robberies. However, after an alarm was tripped they were forced to hole up in a casino penthouse. The Captain (Captain America under another identity), Falcon, D-Man, and Nomad invaded the penthouses and captured the quartet. (Captain America I#338) - The four Serpents were held in the same cell, opposite the vigilantes who'd captured them. Sidewinder teleported in and began freeing the snake-themed villains one-by-one, but by the time he came to the last, Fer-de-Lance, the Captain had broken into the cell and grabbed Sidewinder before he could teleport out. Sidewinder grabbed Fer-de-Lance by the throat and threatened to kill her, forcing the Captain to let him go to save the villainess' life; he took Fer-de-Lance with him when he teleported out. (Captain America I#341/3) - The Society was phenomenally successful in its first year, with each member clearing in excess of a million dollars. (Captain America I#341/3) - Someone still owed the Society for the "Sumatran Rat affair", Van Lunt's Zodiac owed the group money for something, and Hydra had made a promising offer for a hire. (Captain America I#341/3) - Sidewinder introduced the four new Serpents to the charter members, and appointed them as probationary members of the team, with full status to be determined in three months time, and their first assignments to be given the following morning at 9AM. However, Fer-de-Lance summoned in Viper and they proceeded to Black Mamba's room where Viper shot her and donned her costume. She then bit Sidewinder, poisoning him, but he barely teleported away. He popped in on Diamondback, who gave him the Cobra's universal anti-toxin, and the pair teleported to their communications post as Puff Adder broke in the door. On the cameras, they saw a number of snakes they didn't recognize (Coachwhip, Boomslang, Rock Python) in the building, and it became apparent that the newcomers plus some of their own were allied with Viper. Not knowing what else to do, Diamondback called Captain America's Hotline for help. (Captain America I#342) - After being attacked by Fer-de-Lance and Coachwhip, Diamondback activated Sidewinder's cloak, dropping her and Sidewinder in a pond outside. She met up with the Captain, Nomad, D-Man, Falcon, and Vagabond, who had come in response to her call, and while Vagabond took Sidewinder to a hospital the others invaded the Citadel. Bushmaster, Black Mamba, Asp, and Cottonmouth refused to join Viper, so she injected them with a poison which would leave them dead in an hour. Viper sent Black Racer to search the local hospitals for Sidewinder. She found him and Vagabond in an ambulance, but Vagabond defeated Black Racer by throwing her from the ambulance. One Saucer departed carrying Copperhead, Boomslang, and Cobra, while the Captain, Nomad, D-Man, Falcon, and Diamondback invaded the Citadel and took down Anaconda, Rock Python, and Rattler. The Captain and Diamondback proceeded inwards and confronted Viper, Slither, and Coachwhip. Diamondback succeeded in freeing Cottonmouth, only to learn that he'd agree to join Viper. Diamondback and the Captain took out Cottonmouth and Coachwhip, then gave the universal anti-toxin to Asp, Black Mamba, and Bushmaster. Viper and Slither attempted to escape but Nomad and D-Man captured Slither while the Viper fled. (Captain America I#343) - The Viper escaped in a Serpent Saucer, though the Captain leapt on board. Diamondback took another Saucer after, bringing along Nomad, Falcon, D-Man, and Slither, who Nomad wanted to interrogate. They shot down the Viper, unaware that Cap was onboard, but both escaped before it crashed and the Captain knocked out Viper and took her teleportation ring. In Washington D.C., Cobra, Boomslang, and Copperhead were dumping toxins into the cities water supply while Cobra was seriously questioning the wisdom of (and profit in) following Viper. (Captain America I#344) - Cobra, Boomslang, and Copperhead return to their Saucer through a D.C. rife with people mutating into snakes, only to find Diamondback and the Captain waiting for them. Cobra escaped to another saucer where he found Nomad and D-Man inside, guarding Viper and Slither. Viper demanded that Cobra free her but he decided to kill her instead; Nomad deflected the acid bomb and Cobra fled with Nomad following. Viper managed to use the Cobra's acid bomb to escape in the confusion, poisoning D-Man. The Captain and Diamondback found the unconscious D-Man and delivered an anti-toxin to him, the Captain went after Viper while Diamondback stayed with D-Man at Cap's request. Cobra encountered the Viper as she fled the White House and knocked her unconscious. He offered her to the Captain in exchange for 24 hours for the Society to clear out, but the Captain refused, so Cobra turned her over anyway and ran. Diamondback was captured by Captain America (John Walker) and arrested. (Captain America I#345) - His inability to find Nomad and D-Man (who had been arrested beside Diamondback) prevented the Captain from traveling to the Serpent Citadel and closing it down, giving the snakes time to evacuate it with many of their belongings. Sidewinder and Vagabond teleported into Diamondback's cell and rescued her. At Diamondback's request they also freed Nomad, though D-Man declined to be rescued and Vagabond remained behind with him. (Captain America Annual#10/3) - Sidewinder left the group in exchange for a 25% cut of the group's future earnings, and turned all the group's assets over to Cobra, who took leadership. (Uncanny X-Men Annual#13) - Diamondback rejoined the Society just as Cobra accepted a commission from Ghaur (Deviant leader) and Llyra (Atlantean) to retrieve four items of arcane mystic power. Cobra split the Society into squads, but each squad met a team of X-Men (save one which met up with the mystic Mr. Jip) and was defeated. Sidewinder acquired all four mystical items, and sent Cobra and the Serpent Society a ten percent commission based on the payment which he and Diamondback received from Ghaur and Llyra. (Captain America I#355) - Rock Python, Coachwhip, and Puff Adder accosted Sam Wilson (the Falcon) in his office in an attempt to steal his Falcon suit. They were interrupted by Battlestar, which gave the Falcon time to suit up and the pair defeated the three serpents. No reason was given for the attempted theft, though the Falcon speculated that it was some sort of Serpent Society initiation. (Captain America I#365/2) - A disguised Loki visited Cobra and urged him to send the Society after different opponents which they'd never fought before but the Cobra declined, saying the group was motivated by profit, not petty vengeance. Cobra informed the Society, asking them to report anything they heard about the mystery man. Realizing that his own fear of his former partner, Mr Hyde (who had recently escaped from the Vault) was limiting his leadership (Society business was down as a result), the Cobra left Bushmaster in charge of the Society and went after Hyde. (Captain America I#367/2) - Cobra returned to the group; Bushmaster reported that they had to spring Coachwhip and the Asp after they got into a little trouble. Cobra dismissed him, and the following morning announced to a full meeting of the Society that he had recreated himself as King Cobra and intended to lead the group to new heights of infamy. (Captain America I#368) - At a lunch with Diamondback and Black Mamba, Asp reported that the Society's business was booming since King Cobra got his act together; she asked Rachel to return but she declined. A page from the Society told Asp that the Red Skull's people were offering a $100,000 reward for Magneto's whereabouts and Diamondback volunteered that he'd been hanging with the Hellfire Club. (Captain America I#380 - BTS (fb)) - The Serpent Society placed Diamondback under surveillance to make sure she would not betray them, and determined that the man she was dating was Captain America. (Captain America I#372) - While watching Diamondback, Boomslang was rousted by Captain America and subsequently gunned down by a street gang. He was taken to a hospital, with a 50/50 chance of survival. (Captain America I#379/2) - From the shadows a bald-headed (or cowled) figure observed Diamondback with binoculars before passing surveillance onto someone code-named "Streetwalker;" Black Racer (in her civilian identity was subsequently seen watching Diamondback at her gym. Later, another unseen figure in a limousine ordered Black Racer to take Diamondback down, which she quickly did. (Captain America I#380) - King Cobra informed the captive Diamondback that she was to be held trial by the Society for treason. Black Mamba acted as her counsel, King Cobra as judge, and Coachwhip as prosecutor; the Society voted to kill Diamondback for her treason. Black Mamba and Asp threatened to quit if King Cobra followed through, and Sidewinder teleported Diamondback out at the last second. (Captain America I#381) - King Cobra ordered Diamondback and Sidewinder's execution, with a doubled annual bonus to anyone who brought in their corpses. He sent most of the Society out hunting them, and he and Bushmaster confronted Black Mamba and Asp, bringing phone records that showed Mamba had called Sidewinder; King Cobra gassed them unconscious. Diamondback and the mercenary Paladin entered the Society's headquarters in the Stuyvesant Arms Hotel, on East 238th Street, in the Bronx. She gassed Kenny, the desk clerk. Paladin got the drop on Bushmaster and ordered him to take them to Asp and Mamba, but King Cobra shot Diamondback in the back with a venom dart, and forced Paladin to surrender in exchange for the antidote. (Captain America I#382 - BTS) - King Cobra contacted most of the other groups to return to Society headquarters; as Anaconda's group was fighting Captain America at the time they did not get the message. (Captain America I#382) - Rock Python, Puff Adder, and the recovered Anaconda defeated Captain America and called King Cobra, who ordered them to leave the Captain and not return for 24 hours, in case he was faking. Captain America was indeed faking, and tracked their transmission to locate the Citadel. Captain America landed on the Saucer of the returning Cottonmouth and Fer-de-Lance, and quickly took both down. He proceeded inside, where he took down Bushmaster. King Cobra ambushed Cap, forcing him to surrender his shield or see Diamondback killed, but fled only to return with Black Racer, Coachwhip, and Rattler. They were in turn defeated, and Captain America saw King Cobra, Coachwhip, Black Racer, Fer-de-Lance, Cottonmouth, and Rattler hauled away by Guardsmen; Diamondback, Black Mamba, and Asp were allowed to remain free. (Captain America I#385/2) - TV reports noted that King Cobra and six Society members were captured, while Puff Adder, Anaconda, Rock Python, Diamondback, Asp, and Black Mamba remained at large. Those captured were held without bail pending investigation of four outstanding warrants and at least ten charges. Anaconda and Rock Python attacked the other three at Diamondback's apartment. (Captain America I#386/2) - With Puff Adder piloting their hovercraft, Anaconda and Rock Python loaded the three captured former Society members into the ship. They were attacked by MODAM, who threw Python and Adder from the ship. (Captain America I#387) - The Avengers received reports that two Serpent Society members (Rock Python and Puff Adder) were found unconscious in Bay Ridge, Brooklyn. Captain America witnessed them being hauled to the hospital, and briefly questioned Rock Python. (Captain America I#411-414) - Anaconda, Puff Adder, Boomslang, and Rock Python attended an A.I.M. weapons expo on Boca Caliente where Crossbones fought five foes in a prearranged ring-fight before being revealed as Captain America. The four serpents were among the many villains who attacked Captain America en masse after a $50,000 reward was offered for his defeat; the Captain eventually escaped. (Captain America I#434 (fb)) - The Serpent Society paid off the police and manufactured a fake toxic waste alarm to force the residents of Sandhaven Acres, an Arizona retirement community, to sell their homes at a big loss. Through a dummy company the Society bought up the community, turning it into their private headquarters. (Captain America I#434) - In a small town in Arizona, Fer-de-Lance and Rock Python were robbing a bank when they were stopped by Jack Flag. King Cobra interrupted, with Anaconda, Coachwhip, Cottonmouth, and Puff Adder. Flag announced he wanted to join the Society; Anaconda knocked him unconscious and they took his body along when they helicoptered back to their base. As an initiation test King Cobra sent Jack to steal something a painting for him, not telling Flag that he was stealing from Mr. Hyde. The next morning at the Sandhaven Community Center, King Cobra was very surprised when Flag showed up with the painting. (Captain America I#435) - King Cobra auditioned Jack as his eventual replacement as King Cobra, forcing him to run a gauntlet of the Society serpents. The fracas was interrupted when Mr. Hyde showed up and took down Puff Adder and Anaconda. Captain America (secretly summoned by Flag) also showed up and faked his own defeat at the hands of Jack Flag/ King Cobra and Bushmaster, Fer-de-Lance, Cottonmouth, Rock Python, and Rattler; they took him to the real King Cobra. Coachwhip, in the meanwhile, encountered and was defeated by Cap's prot�g�, Free Spirit. Disguising herself as Coachwhip, Spirit tried to rescue Cap; Jack Flag revealed his true colors and joined her, and King Cobra flushed Captain America out the swimming pool and out into the desert. With Mr. Hyde, King Cobra went after Cap, leaving the rest of the Society to finish the other two. (Captain America I#436) - Captain America defeated King Cobra and Hyde before collapsing; Jack Flag and Free Spirit fled and were being pursued when the Avengers' Hank Pym (Giant-Man) showed up and knocked out Rattler before leaving to find Cap. (Captain America I#437) - The remainder of the Society had Jack Flag and Free Spirit cornered when Force Works (an Avengers' offshoot) came to the pair's aid; within four minutes the Serpent Society was defeated. They were taken into custody by the team, as were King Cobra and Mr. Hyde. (Official Handbook of the Marvel Universe: Teams 2005) - Using the stolen Brand/Roxxon technology which the Society had long ago acquired in their first "test missions" under their former leader Sidewinder, the Society created/equipped new Sidewinders. (Captain America IV#30) - Bushmaster, Puff Adder, and Asp burst in on Captain America's apartment. Asp blasted both of them, knocking out Captain America but not Diamondback, leading Asp to note for the benefit of the other's that her blast should have knocked out Rachel as well. Captain America and Diamondback (really an LMD) were transported to the Society's underground New York-area headquarters and chained there. (Captain America IV#31) - King Cobra taunted Diamondback (again, really an LMD), promising to punish her for her betrayal; he then left both her and the Captain chained for 16 hours while he contacted several of Captain America's foes to arrange the auctioning off of the hero. When the time for the auction came, King Cobra had Anaconda and Puff Adder take the Captain down, but Cap escaped, knocking out both of them; King Cobra had time to summon the rest of the Society before being knocked out himself. Captain America took out Rattler, Black Mamba, Coachwhip, and Bushmaster; Diamondback took out Black Racer, Fer-de-Lance, Rock Python, Cottonmouth, and Sidewinder. Asp was present as well but apparently escaped. SHIELD took the Society into custody. (All-New Official Handbook of the Marvel Universe Update#2/Secret War#3-5) - Lucia von Bardas contacted the Serpent Society. King Cobra worked for her and was ultimately betrayed, like he had expected from the start. (Nova IV#19) - A group of Serpent Society members comprised of Anaconda, Black Mamba, Copperhead, the new Death Adder, Fer-de-Lance and Sidewinder were unnerved by the worldwide invasion of the Skrulls. They took over a compound in Danzig, Ohio, barricading themselves, their loved ones, and many hostages inside. However, members of the Nova Corps (Nova (Richard Rider), Malik Tarcel, Irani Rael, Qubit, Fraktur, Morrow) invaded the compound and dispatched the entire group within seconds, then turned them over to federal authorities. (Wolverine III#73/1) - On a Monday, several Serpent Society members (Anaconda, Black Mamba, Bushmaster, Cottonmouth), fought members of the New Avengers (Captain America/Barnes, Luke Cage, Ronin/Barton, Spider-Woman/Drew, Wolverine) in a semi-tropical locale (palm trees were nearby). Two classic Serpent Saucers were seen hovering in the distance, implying that other members of the Society were present or at least nearby. (X-Men: To Serve and Protect#2/1) - Mr. 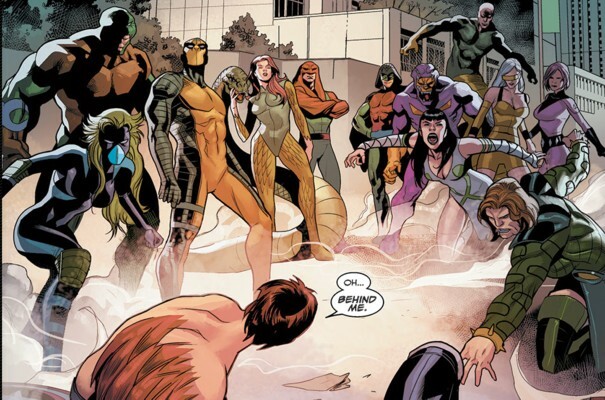 Negative hired the Serpent Society to eliminate two new vigilantes (Anole and Rockslide, both disguised young X-Men) who were impacting on his criminal activities. Soon after, a trap was sprung and the two vigilantes faced King Cobra, Bushmaster, Rattler, Anaconda and the new Death Adder. (Battle Scars#4) - Johnson and Taskmaster fought the Society members. They escaped them when Deadpool entered the fray to save or rather capture Johnson himself. (Avenging Spider-Man#4) - Sidewinder attempted to gas Grand Central Station, but Spider-Man knocked him out. (Avenging Spider-Man#5 - BTS) - Chemicals used to create Copperhead's snake gas were bought by the Serpent Society. The Avengers learned about it. (Avenging Spider-Man#5) - The Avengers intercepted the delivery and caught Anaconda, Cottonmouth and Copperhead. (Avengers vs. X-Men#0) - Serpent Society members Ananconda, Asp, Bushmaster, Cottonmouth and Puff Adder robbed a bank and held hostages. Hope Summers attacked them and violently knocked the villains out. (Avenging Spider-Man I#11) - Although alone, Copperhead declared that Spider-Man was now an enemy of the Serpent Society after the hero foiled his robbery. (Elektra III#6) - The Serpent Society (Sidewinder, Anaconda, Black Mamba, Death Adder) found their targets in the Himalayas at the Quiet Refuge, a long-forgotten Inhuman memorial, nearby the former location of Attilan. They concentrated their attacks on Elektra to lure the others to Cape Crow's hideout where Lady Bullseye was already waiting to slay him. Elektra followed her allies to Cape Crow's hideout after taking out all Serpent Society members with a variety of injuries. (Captain America: Sam Wilson#5 (fb) - BTS) - Under Viper (Jordan Dixon)'s new leadership Serpent Society rebranded themselves as Serpent Solutions, a corporation that sold their services to other big corporation. They mostly did the diry work for other corporations and then sold back the end results for a huge profit while their executives were given plausible deniability for how their products were created. Serpent Solutions quickly gained many friends in big corporations and on Wall Street. With the money provided to them by big companies Serpent Solutions bankrolled numerous facilities all over the US and hired old Hydra and A.I.M. scientists. (Captain America: Sam Wilson#3 (fb) - BTS) - Malus was hired by Serpent Solutions as a bio-engineer. (Captain America: Sam Wilson#5 (fb) - BTS) - Serpent Solutions funded the white supremacist Sons of the Serpent in the southwest. (Captain America: Sam Wilson#6 (fb) - BTS) - Serpent Solutions funded Malus, who worked under a strict work-for-hire agreement for them. (Captain America: Sam Wilson#3) - Serpent Solutions' leader Viper with Puff Adder and Cobra serving as his bodyguards met with representatives of the cosmetics industry to show them a commercial for the bio-engineering (mutating of humans into human/animal hybrids) Serpent Solutions offered. One representative wanted to know if Serpent Solutions could still deliver after the destruction of Dr. Malus' lab and Viper assured him that Malus was not the only scientist they had working on bio-engineering. Regarding the threat Captain America posed Viper asked them not to worry because Serpent Solutions would take care of it while their partners kept getting richer. (Captain America: Sam Wilson#2 (fb) - BTS) - Malus set up a lab in New York funded by Serpent Solutions. Via Serpent Solutions Malus paid 5,000 dollars for each healthy male the Sons of the Serpent shipped to his lab. (Captain America: Sam Wilson#6 (fb) - BTS) - Contract and consulting outfit Serpent Solutions was featured on the cover of Farbes, which praised their unconventional practices and ruthless approach to development. Serpent Solutions announced lucrative deals with leading pharmaceutical, tech and manufacturing companies. (Captain America: Sam Wilson#4) - Representing Serpent Solutions Viper had a meeting with some of the most influential people on Wall Street. He offered the services of Serpent Solutions to do the dirty work while the rich were getting richer. Senior Vice Preseident for Public Relations and Community Affairs Greg Williams spoke out against Viper, called him a criminal and was going to leave the meeting when he was stopped at the door by Puff Adder and Cobra, the latter apparently killed him. Nobody else at the meeting had a problem with Serpent Solutions' criminal origins and agreed to do business with them. Captain America (Wilson) and Diamondback were nearly run over by a truck. Black Racer, Copperhead and Cottonmouth jumped out of the back of the truck and attacked them. Black Racer seemingly stabbed Diamondback in the gut, which distracted Wilson for a moment, but it was not enough to take him out. Cap went feral and knocked out the three serpents, forcing Diamondback to reveal that she had been in cahoots with them all along and stab Wilson with a poison tipped diamond, rendering him unconscious. (Captain America: Sam Wilson#4 (fb) - BTS) - They delivered Cap to Serpent Solutions' offices. (Captain America: Sam Wilson#5 (fb) - BTS) - Asp used a venom-bolt to paralyze Cap for some time. (Captain America: Sam Wilson#4) - When Cap woke up he was chained to a chair in Serpent Solutions' conference room in a meeting of the whole villainous roster of Serpent Solutions. Viper welcomed him. (Captain America: Sam Wilson#5) - Serpents Solutions' members silently listened to their leader Viper monologuing about what they were doing to the paralyzed Captain America (Wilson). He ended his monologue by pushing Wilson out a window despite Diamondback's protesting. The new Falcon (Torres) caught Wilson, saving him from certain death. Viper and a large contingent of snakes (Anaconda, Asp, Black Racer, Boomslang, Bushmaster, Coachwhip, Cobra, Cottonmouth, Diamondback, Princes Python, Puff Adder) descended from their offices to the street to end Falcon and Cap. While the battle was going on it and Serpent Solutions were discussed live on TV by experts. Serpent Solutions' stock rose while it looked they were going to win, but when they lost their stocks crashed, bankrupting Serpent Solutions in the process. Cap and Falcon took Viper to a secret meeting between some of Viper's former business associates. Cap tossed him through the skylight and then threatened them all with the help of his hacker Whisperer (Rick Jones). (Captain America: Steve Rogers#13 (fb) - BTS) - Most got out of prison again. (Captain America: Steve Rogers#13) - Baron Zemo met with Serpent Solutions to ask them to join his Army of Evil. When the Army of Evil gathered Viper attended alongside Anaconda, Coachwhip, Cottonmouth, Puff Adder, Princess Python, Rock Python and Sidewinder. Given the "are they or aren't they?" membership status of several people, notably Black Mamba, Asp, and Copperhead, it would appear that the Society has a very loose "active membership" criteria - unless you're actively booted out, you're always welcome back. So, everyone excepting Diamondback, Princess Python, Sidewinder (Voelker), and Viper could still be considered a member if they wanted; as Slither has never appeared with the group, so far, he appears to not want to be a member. In Uncanny X-Men Annual #13, Sidewinder revealed to Diamondback that all Society members had tiny transceivers implanted into their necks, under their skin, so that he could track them. Presumably all the original Society members had these (and may still have them), though given that Sidewinder had to have the entire group search for Death Adder, clearly these were implanted after Death Adder was killed, but before Viper's takeover. In Captain America I#379/2, the unseen figures were certainly Serpent Society members. Based on his shape, the bald-headed (or cowled) figure with binoculars was most likely Cottonmouth; Bushmaster does also fit the silhouette but would have been unlikely to have enthusiastically helped with this. Given that Black Racer was seen following Diamondback at the gym, she was almost certainly "Streetwalker." The voice giving Black Racer orders from the limousine was probably King Cobra. 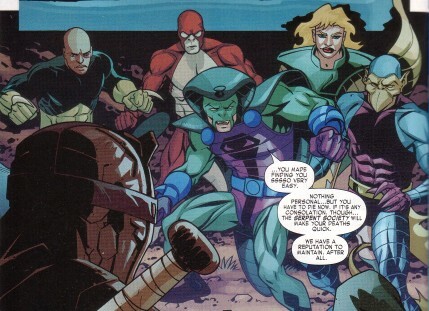 A couple of sub-groups of the Society have appeared, but neither was really a Serpent Society appearance per se. In Thunderbolts II#104 & 107, Bushmaster, the new Death Adder, King Cobra, and Rattler fought beside the Thunderbolts. In Amazing Spider-Man I#562-563, Coachwhip, Fer-de-Lance, Puff Adder, Rattler, and Rock Python hung out together at one of the many "Bars With No Name." In the 2006 Jim Butcher novel Spider-Man: The Darkest Hours, page 255 has a throwaway mention of the Serpent Society by Spider-Man, in a list of "totemistic super folk" (those based on animals). In the novel Iron Man: Operation A.I.M. (1996) by Greg Cox (pg. 30), Captain America begs off helping Iron Man in order to "look into reports of renewed Serpent Soceity activity near Seattle." Captain America and the Black Panther later (pg. 100-) apparently encounter the Cobra (Voorhees) in Wakanda, but that Cobra proves to be an adapoid, and is not related to Cap's earlier actions. Jim Sharpe correctly points out that in the main image used here, Copperhead is miscolored - his coloration seems to be that of Cobra. The correct coloration can be seen in the entry for Copperhead. Though not listed above, it seems likely that King Cobra would have invited his newly empowered nephew, the new Cobra, to join. If such an invitation was issued, it was apparently declined. Captain Samerica update by Markus Raymond with additional image and improved main by Loki. Among others, Sidewinder (Voelker), Black Mamba, Death Adder (Burroughs), Anaconda, and Bushmaster were empowered using equipment at Brand's Long Island facility. Following that facility's shutdown, Sidewinder had Anaconda, Rattler, and Cobra (Voorhees) steal the mutagenic equipment for the Serpent Society's use. Gaston acted as a butler at the team's Sandhaven, Arizona headquarters. Hallsy was one of several mechanics for the Society. When Fer-de-Lance and Cottonmouth returned a Saucer, he was asked to give it an overhaul, and after Captain America defeated the two he told Cap where to find some rubber hose to tie them (as well as Hallsy and another mechanic) up. He was taken into police custody thereafter. Keener worked in communications for the Society, and took Anaconda's call when she was informing King Cobra that she, Rock Python, and Puff Adder had defeated Captain America. Kenny was the desk clerk at the Stuyvesant Arms Hotel Citadel, and was familiar with the Society members. Diamondback gassed him unconscious when she and Paladin invaded the Citadel. He was presumably taken into police custody when Captain America shut down the headquarters thereafter, though it is possible that he recovered and escaped. The Serpent Society Citadel was the Society's upstate New York headquarters, located near the city of Pawling. 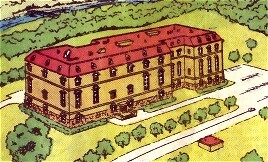 It was an abandoned mental hospital purchased by Seth Voelker (Sidewinder) and held in his name. It possessed residential and training areas for the team, a communications center, an infirmary, drop tubes on each floor which led to the hangars, and a relaxing natural-seeming indoor pond area which was, of course, filled with snakes. Residential areas were decorated with a snake motif, complete with ornate serpentile headboards and mirrors. Serpent Society members were given micro-communicators which were monitored from here, but which did not require the Citadel to operate. The team also possessed a smaller base in a multi-story hotel, the Stuyvesant Arms Hotel on East 238th Street in the Bronx (New York City, New York), and this too was occasionally referred to as the Citadel. This base had many of the same facilities (presumably much of the prior Citadel's equipment was relocated here after that base was closed), and it included technology to create an artificial cloud bank over the building's rooftop to hide the comings and goings of the Serpent Saucers. This became the group's primary headquarters after the Viper's takeover, but was closed after Captain America and Paladin invaded it following Diamondback's trial. The team later relocated to the Sandhaven Community Center at 1260 Camden Drive, Sandhaven, Arizona. They remained there until Captain America, Jack Flag, Free Spirit, and Force Works captured them there. This headquarters lacked most of the previous high-tech equipment; the team was even relegated to using helicopters for transport instead of Serpent Saucers. The team eventually relocated into catacombs beneath New York City. These headquarters were immense, possessing several levels and exits. SHIELD closed this down after Captain America defeated the Society there, though it is unknown whether or not they located the entirety of the headquarters. The Serpent Saucers were the Society's means of transport, initially purchased by Seth Voelker (Sidewinder). They were derived from AIM's hovercrafts, included external vidcams and global tracking devices, and were armed with heat-seeking missiles. They could travel in a quiet stealth mode. The Society initially possessed a minimum of six Saucers; one was shot down and destroyed by the Scourge, another was stolen by Viper and shot down by Diamondback. The Society also possessed at least three non-customized ovoid silver hovercrafts, also known as Serpent Saucers. One was hijacked by MODAM and taken to Superia, another was stolen by B.A.D. Girls, Inc.
Wilburn was a hired servant to Seth Voelker (Sidewinder). During Voelker's period as head of the Serpent Society, Wilburn served as major domo for the group. He was present during the group's formative meeting, passing out membership brochures.